We’d love your help. Let us know what’s wrong with this preview of Outside Your Window by Nicola Davies. This gorgeously illustrated volume of poetry — sprinkled with facts and fun things to do — sows an early love for nature in all its beauty and wonder. The buzz of bees in summertime. The tracks of a bird in the winter snow. This beautiful book captures all the sights and sounds of a child’s interactions with nature, from planting acorns or biting into crisp apples to studyi This gorgeously illustrated volume of poetry — sprinkled with facts and fun things to do — sows an early love for nature in all its beauty and wonder. To ask other readers questions about Outside Your Window, please sign up. GORGEOUS! I heart everything about this nature book. It's poems, the illustrations (!! ), the paper it is printed on, and the earnestness in which it endeavors to interest children in nature. Well-done! Wow. So much in this little book. More than I expected and a very good one if you are interested in nature and the 4 seasons. 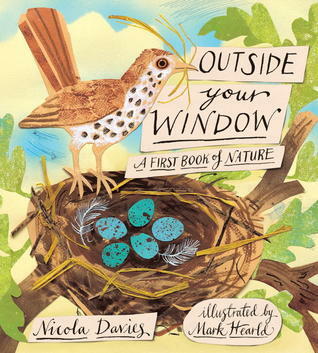 “Outside Your Window: A First Book of Nature” by Nicola Davies and illustrated by Mark Hearld (Candlewick 2012) is a stunning work. The 110 page picture book progresses through the seasons, starting with spring. The poems are simple and straightforward for the most part. Which makes the author’s occasional metaphors and similes light up her poems. The spectacular art, which we’re told is mixed media, draws you into the author’s observations of each poem. 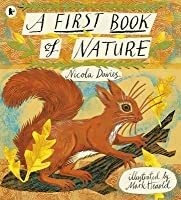 By the look, I’d say the artwork is a coll “Outside Your Window: A First Book of Nature” by Nicola Davies and illustrated by Mark Hearld (Candlewick 2012) is a stunning work. The spectacular art, which we’re told is mixed media, draws you into the author’s observations of each poem. By the look, I’d say the artwork is a collage of watercolor, gouache, and ink on paper. In “Bulbs” Davies writes, “something tells the bulb it’s time to grow./Inside its brown coat and layers like an onion,/ a tiny pulse beats…” The author has watched nature and passes her acute observations to us through a child-like eye, making us experience nature afresh. In “Nesting” artist Hearld uses actual strands of straw in the bird’s beak and in the nest she’s building. It makes you feel like you’re helping to construct the nest. In “Flowers,” Davies writes, “Without a sound the flowers call out./ They shout to insects with their colors—” What we normally see, the author has made us hear. Let’s listen to our gardens. In “Tide Pooling,” Hearld uses mono-printed fish or crayfish in the larger spread. That is, he’s made a woodcut or linoleum cut or maybe a potato cut of one fish, and printed it in various colors across his larger composition. The artwork makes you want to try some of his child-friendly techniques. In “Starlings,” she says of the flying starlings, “hundreds, thousands maybe…They look like smoke, or a curtain rippling in the breeze…as their flying is a dance that they all know by heart.” Nice image, but the clincher is the heartfelt dance. Perhaps my favorite of the poems is “Snow Song” in which Davies speaks of falling snow. “Listen, and you can hear the quiet,/ as if every sound had been wrapped up and put away.” And “snow kept a diary” of animal and bird footprints. Read this book and look outside your window. Go outside and see nature. Observe her acutely. This is a great book for studying and writing poetry in the classroom. The free verse poems invite you to make your own observations. I must admit that I don't read a lot of children's poetry, but one of the things I've been trying to do is broaden my appreciation of children's books in general. I fell so in love with the illustrations & design of Outside Your Window that I ended up reading the poetry and not just the illustrations. While I try not to buy too may books, I kept going back to pick this one up and reasoned that if I waited to have children, it would probably be out of print, so if I loved it (and I do!) I had I must admit that I don't read a lot of children's poetry, but one of the things I've been trying to do is broaden my appreciation of children's books in general. I fell so in love with the illustrations & design of Outside Your Window that I ended up reading the poetry and not just the illustrations. While I try not to buy too may books, I kept going back to pick this one up and reasoned that if I waited to have children, it would probably be out of print, so if I loved it (and I do!) I had to buy it. So now it sits on my shelf and every day or so, when I'm tired of typing papers, I pull it from the shelf and randomly flip it open. When my former colleague brought this book into school I fell in love with the beautiful illustrations and knew I had to buy it. Each and every page is rich with an exciting new landscape waiting to be explored through the poems and artwork. With its short verses and stunning illustrations in a sturdy hardback cover this book would be a joy to read to any class (Rec, Y1) where everyone can join in the experience. It would be valuable for a ‘Countryside’ topic as it could help to cover many aspec When my former colleague brought this book into school I fell in love with the beautiful illustrations and knew I had to buy it. Each and every page is rich with an exciting new landscape waiting to be explored through the poems and artwork. With its short verses and stunning illustrations in a sturdy hardback cover this book would be a joy to read to any class (Rec, Y1) where everyone can join in the experience. It would be valuable for a ‘Countryside’ topic as it could help to cover many aspects of the four seasons. It is enough to ignite a love for nature in any young child. There are potentially numerous ways of using this wonderful book in the classroom, for example, the ‘Listen to the Pond’ page could accompany a lesson on pond dipping. It could be used to inspire an Art lesson in printmaking/stencilling or as a basis for writing short stories or poems themed around nature. Another good page is the one about worms, helping to emphasize the need to take care of nature and not to harm small creatures. Some of the writing may appeal more to older children so of course some pages will be more useful than others but if nothing else it is a gorgeous and useful addition to any KS1 classroom. Explore nature through the seasons in this lush book of poetry that starts with the first moments of spring with melting icicles and the green shoots of bulbs. Summer is filled with butterflies, chickens, baby birds and bees. Autumn comes with leaves, wind, geese and acorns. And winter ends the year filled with snow, deer and ducks. The poems range from merry verse with lighter tones to atmospheric pieces that make you stop and think. It is this range of moods and depth that makes the book so ve Explore nature through the seasons in this lush book of poetry that starts with the first moments of spring with melting icicles and the green shoots of bulbs. Summer is filled with butterflies, chickens, baby birds and bees. Autumn comes with leaves, wind, geese and acorns. And winter ends the year filled with snow, deer and ducks. The poems range from merry verse with lighter tones to atmospheric pieces that make you stop and think. It is this range of moods and depth that makes the book so very readable and enjoyable. The poems are lovely and the pictures have great depth. It's subtitled "A First Book of Nature" which in my mind indicates a very young audience but this book is far to sophisticated for that age group, the size is also awkward for small hands. Somehow I didn't realize that this is a book of poetry around the theme of nature. Lovely book just in time for National Poetry month. Read-Aloud Revival recommendation for April picture books. One of my favorite children's book to date. The hand-lettering, the illustrations, the range of nature study content...everything in this book is well-done and gorgeous. The book itself would be an amazing volume to add to a home library. We found our copy at the library, but I'll definitely be purchasing one. A hefty volume worthy of ownership, or at least multiple checkouts from the library! This volume of poetry is divided among the seasons with titles such as “Lamb’s Tails” and “Five Reasons to Keep Chickens” for any occasion. Perhaps it will even inspire little poets to write their own works about the world outside their windows. The artwork is gorgeous and how each page is filled with season related poems and paragraphs about nature. I loved every page. Beautiful book. The art and the poems truly captured the essence of each season. It made me reminisce fondly of my less complicated and less media driven childhood. Such a sweet book for beginning readers or read-to's. Nature introduction at its finest. Beautiful artwork by Mark Hearld. The text was not very engaging. This is about the four seasons. My daughter loved the illustrations. Gorgeous book, both the illustrations and the thoughtful prose. Our three year old was so drawn to the pictures. I want our own copy. Inspiring mixed media artwork -- a gorgeous book. Full of science, poetry, and beauty. A must for getting little ones curious about nature. A wonderful book. Beautiful illustrations and lovely poetry. The first thing I noticed about this book was the size. The large format lends itself to the beautiful illustrations and the subject matter: the breadth and wonder of nature. The opening pages are just as inviting as the collage image on the cover and include a page on which the child can write his or her name. Through a series of poems organized by season, Davies invites children and their caretakers to experience nature using all the senses of sight, smell, feeling and sound. Reading the poems The first thing I noticed about this book was the size. The large format lends itself to the beautiful illustrations and the subject matter: the breadth and wonder of nature. The opening pages are just as inviting as the collage image on the cover and include a page on which the child can write his or her name. Through a series of poems organized by season, Davies invites children and their caretakers to experience nature using all the senses of sight, smell, feeling and sound. Reading the poems children can learn about how nature works and the information in the poems may answer many of the why questions about nature that children often ask: Why do worms come out of the ground and what do they do? How is soil formed? What will you find in a pond? Davies includes the child reader in her poems by asking questions, inviting them to do things and observe nature on their own. She starts with words and images that kids know such as cows and dandelions, bird nests and worms and expands by teaching kids how nature works. She also teaches kids how to be in nature, for example, sweep the pond and observe what you find but put it back when you’re done. She encourages wonder and interaction with nature to the extent that at the end she includes recipes for berry jam and bird cups as well as tips for seed saving. The illustrations perfectly illustrate the poems and highlight the main idea or image of each poem. Hearld’s art shows the love he put into the images he crafted and each one is a jewel. I must say for the most part I liked the artwork more than the poems themselves. Hearld uses collage, print, and painting to create images that fill the page with the wonder of animals, insects, birds, flowers, plants, amphibians and other aspects of the natural world. People are few and far between and when they are there, they are usually mentioned in the poems. He also does not separate nature from the modern world. Some of the images include buildings ranging from factories and rowhouses to houses and farms. This makes the poems and images more inclusive and invites kids from urban, suburban and rural settings to experience nature for themselves. Davies skillfully engages the senses through her use of alliteration, assonance and consonance. Most poems are written in free verse but a handful are rhyming poems. The poems work best read aloud and this would be a wonderful book to share with an individual child or during a story time at a library. I have to start by saying the illustrations in this book are amazing! This book is a first look at nature, and the illustrations did just that. They are so descriptive and take up the entire page. While a teacher is reading these poems to students, they are becoming involved in these stories because of the illustrations. For the younger students, these illustrations will really help them comprehend what is being read to them. I loved this book for this reason, and this is what resonated with me I have to start by saying the illustrations in this book are amazing! This book is a first look at nature, and the illustrations did just that. They are so descriptive and take up the entire page. While a teacher is reading these poems to students, they are becoming involved in these stories because of the illustrations. For the younger students, these illustrations will really help them comprehend what is being read to them. I loved this book for this reason, and this is what resonated with me the most from this book. The poems that drew me in the most were the ones about the changing of seasons and the ones with very unique titles. A lot of the poems use unique titles that are not mentioned anywhere in the text at all. For example, on a page discussing spring, the title of a poem is called Cherry Blossom. The name of this poem reflects the title and theme of the book, but is also very specific, which helps children expand their vocabulary and learn something new every day. "Outside Your Window: A First Book of Nature" written by Nicola Davies is a dazzling read in it's lyrical presence and it's brilliant illustrations. Written in free verse poetry, this book follows the seasons and observes it's patterns and changes. Eyeing stars, birds constructing nests, apples ripe for fall, snow falling all around and other naturally occurring developments are all beautifully described and cataloged. This book is for young readers, especially readers who are interested in poetr "Outside Your Window: A First Book of Nature" written by Nicola Davies is a dazzling read in it's lyrical presence and it's brilliant illustrations. Written in free verse poetry, this book follows the seasons and observes it's patterns and changes. Eyeing stars, birds constructing nests, apples ripe for fall, snow falling all around and other naturally occurring developments are all beautifully described and cataloged. This book is for young readers, especially readers who are interested in poetry, description and observational writing. The descriptions in "Outside Your Window" are so appealing, marvelous, lovely and true. What a great source to have in the classroom! Not only to teach of the changing seasons and the earthly creatures who adjust and harbor with it but to help promote creative writing and poetry. Students can be inspired to write their own free verse poems during a poetry lesson/project with original description and true voice. I also think this is a beneficial tool to show a different type of poetry--one that does not rhyme. This would be great book for Deaf students as they are already masters at storytelling, it would be fun to have them write and sign their own stories about the changing seasons and be creative and original. What a wonderful and rousing read. I really appreciate it's creative nature and how it can nurture imaginative minds. Nicola Davies is a zoologist and an award-winning author who’s written many books for children. Of writing Outside Your Window, she says, “I cast off my grown-up self and found the me I was at five or six. From inside that younger self I could see the world as I saw it first–not just the sights and sounds of nature but also the feelings and the thoughts about it that ran through me, strong as the tide. This book comes to you from that little girl, who sat in a barley field at dusk and felt the w Nicola Davies is a zoologist and an award-winning author who’s written many books for children. Of writing Outside Your Window, she says, “I cast off my grown-up self and found the me I was at five or six. From inside that younger self I could see the world as I saw it first–not just the sights and sounds of nature but also the feelings and the thoughts about it that ran through me, strong as the tide. This book comes to you from that little girl, who sat in a barley field at dusk and felt the world turning.” From the buzz of bees in summertime to the tracks of a bird in the winter snow, this lovely book of original poems by Davies captures the sights and sounds of a child’s experiences with nature, including planting an acorn, biting into a crisp apple, watching the birds overhead and stargazing. The volume is beautifully illustrated by Mark Hearld who uses collage, printmaking and painting techniques to capture the outside world whether in the city or in the country. Check out this handsome book from the library and read some poems to your favorite child. Or, buy Outside Your Window as a gift to give someone special in April and encourage that child to discover the beauty in nature through poetry during National Poetry Month. Lovely and graceful poetry, accurately evoking all of the feelings of being outside during all four seasons. During the spring poems, I could hear the rain, during the summer poems, I could practically feel the warmth of the sun on my face (though maybe that was the building's heat going a little overboard...). I could feel the fall's crisp air and taste its delicious treats, and winter feels warm and cozy from inside. I especially loved the Pond Dipping poem - makes me feel like I am 10 years ol Lovely and graceful poetry, accurately evoking all of the feelings of being outside during all four seasons. During the spring poems, I could hear the rain, during the summer poems, I could practically feel the warmth of the sun on my face (though maybe that was the building's heat going a little overboard...). I could feel the fall's crisp air and taste its delicious treats, and winter feels warm and cozy from inside. I especially loved the Pond Dipping poem - makes me feel like I am 10 years old and back behind my parents house in the creek, dancing around crayfish and trying to figure out what else is floating in there. More than one of these poems made me feel like I was exploring in my backyard again. it's made the world look new and neat and clean. Exactly how I feel about winter. Illustrations (mixed media? Paint and paper cut-outs?) are beautiful and complement the poems perfectly. I loved this, but I wonder if it is more for nostalgic adults than kids too young to be nostalgic yet. This beautifully written and illustrated collection of poems follows the changing seasons and introduces children to natural processes like bulbs sprouting in spring and dandelions turning to seed: (“Dandelions bloom like little suns./but the flowers don’t last long-/they fold up like furled umbrellas pointing at the sky”). 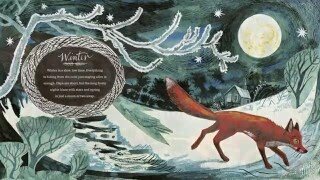 Zoologist and author, Nicola Davies evokes the feel of each season with concise and observant free verse: “Winter is a slow, low time. Everything/is hiding from the cold; jus This beautifully written and illustrated collection of poems follows the changing seasons and introduces children to natural processes like bulbs sprouting in spring and dandelions turning to seed: (“Dandelions bloom like little suns./but the flowers don’t last long-/they fold up like furled umbrellas pointing at the sky”). Zoologist and author, Nicola Davies evokes the feel of each season with concise and observant free verse: “Winter is a slow, low time. Everything/is hiding from the cold; just staying alive is enough”. Mark Hearld illustrates each poem, capturing the textures, beauty, and whimsy found in nature. With collage, paint, woodcuts, and other mixed media these luscious works of art invite the viewer to return again and again. Both the illustrations and the poems will inspire children to spend time every season of the year playing and observing the outdoors. Davies also provides instructions for activities like seed saving, making a bird feeder, and baking berry crumble, “Eat. Yum”. "I was very small when I saw my first dolphin," says zoologist Nicola Davies, recalling a seminal visit with her father to a dolphin show at the zoo. Enchanted at the sight of what she called the "big fish" jumping so high and swimming so fast, she determined right then that she would meet the amazing creatures again "in the wild, where they belonged." And indeed she did--as part of a pair of scie "I was very small when I saw my first dolphin," says zoologist Nicola Davies, recalling a seminal visit with her father to a dolphin show at the zoo. Enchanted at the sight of what she called the "big fish" jumping so high and swimming so fast, she determined right then that she would meet the amazing creatures again "in the wild, where they belonged." And indeed she did--as part of a pair of scientific expeditions, one to Newfoundland at the age of eighteen and another to the Indian Ocean a year later. In WILD ABOUT DOLPHINS, Nicola Davies describes her voyages in a firsthand account filled with fascinating facts and captivating photographs of seven species of dolphins in action. Nicola Davies's seemingly boundless enthusiasm for studying animals of all kinds has led her around the world--and fortunately for young readers, she is just as excited about sharing her interests through picture books. The zoologist's latest offering puts a decidedly quirky twist on her years of experience: POOP: A NATURAL HISTORY OF THE UNMENTIONABLE is a fun, fact-filled guide to the fascinating world of poop across species. "As a zoologist, you are never far from poop!" the writer explains. "I've baked goose poop in an oven with my dinner, looked at bat poop under the microscope, and had my T-shirt stained pink with blue-whale poop. I was obviously fated to write this book." The exceptional combination of Nicola Davies's zoological expertise and her first-rate children's writing is apparent in her remarkable catalog of award-winning titles. Her first book with Candlewick Press, BIG BLUE WHALE, was hailed by American Bookseller as an "artfully composed study" offering "language exactly appropriate for four- to seven-year-olds and precisely the right amount of information." In ONE TINY TURTLE, Nicola Davies's clear, compelling narrative follows the life of the rarely seen loggerhead turtle, which swims the oceans for thirty years and for thousands of miles in search of food, only to return, uncannily, to lay her eggs on the very beach where she was born. The author's next book, BAT LOVES THE NIGHT, is a tenderly written ode to a much-misunderstood flying mammal, the pipistrelle bat, while SURPRISING SHARKS--winner of a BOSTON GLOBE-HORN BOOK Honor Award--contains unexpected facts about another one of the planet's most infamous animals. When she is not off on scientific expeditions, Nicola Davies lives in a cottage in Somerset, England, where she is lucky enough to have pipistrelle bats nesting in her roof.